I found out early Thursday morning that my trainer and friend had suffered an unthinkable tragedy: Her son was killed and her husband severely injured in a horrible tractor accident. I've known Roman since he was born; Panama was the first horse he ever sat on (as an infant, with Leslie holding onto him and me holding Panama). He rode both my horses at V.'s 12th birthday party a year and a half ago, and I think those might have been his first rides, too. I can remember Leslie bringing him to my lessons when he was just a baby and putting him in a tire in the shade. He was such a good baby, and he'd grown into such a good kid. 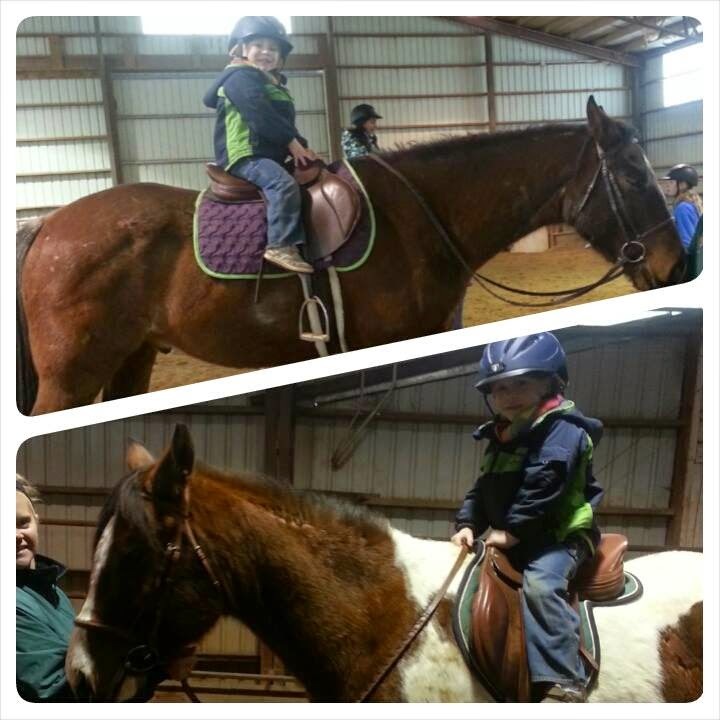 And on her Facebook page, I snagged this one of Roman on my horses (I took the pictures). He was so little then! He had really grown up a lot when I saw him at Grand Prix this January. Today she posted an update on her Facebook page: Her husband Matt will lose his lower left leg. He's scheduled for surgery in the morning. He has a very long recovery ahead of him -- in addition to the extent of the injuries to his leg, his lower back was badly injured as well, and will need extensive skin grafting -- and I'm guessing he won't be able to work for a long time to come. One of Leslie's best friends -- and my farrier -- has, with the help of her family, set up a funding campaign for her and her husband. I wanted to share it on here to get the word out, even though I know none of you know her. If anyone is blessed enough to be able to help, please consider it, or at the very least consider sharing the link. I'm so sorry. This is heartbreaking.